Product prices and availability are accurate as of 2019-04-21 10:07:37 EDT and are subject to change. Any price and availability information displayed on http://www.amazon.com/ at the time of purchase will apply to the purchase of this product. 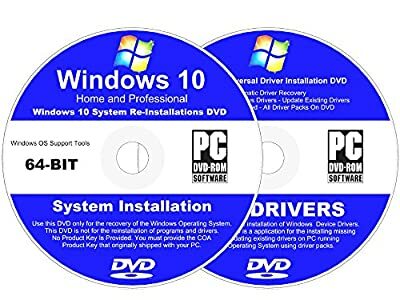 Windows 10 Re-installation DVD Support Home and Professional Installations. This DVD allows you to Re-Install the Windows 10 Operating System to Restore your computer's Operating System back to how it was when it was new. This Re-Install DVD will allow you to restore your machine to its original factory settings. Also, it will allow you to reinstall Windows on a new hard drive. Please Note (Read): You must have an original product key that came with your computer. This Re-Install DVD do not come with a Windows Product Key. You will need your Microsoft Product Key (license number) that came with your computer. The Windows Product Key is a 25 digit code and can be found on the bottom of your laptop (sometimes under the battery) or on the side (sometimes back) of your desktop / tower pc.